Nothing is more important than helping people to live full, independent and dignified lives within the comfort of their own home. Competent Home Health Care dedicated to providing the kind of medical/non medical in home care that helps enrich lives and maintain the highest possible level of independent living. We offer an extensive range of medical/non medical care services tailored to the unique needs of each individual we serve. Competent Home Health Care is an available resource for questions and concerns that may arise regarding the care of your loved one. Our caring and compassionate staff can assist you with preparing for your loved ones return home from a hospital or rehab facility and once home can provide the assistance that is necessary to ensure their safety and their personal well-being; or perhaps your loved one just needs that little bit of additional care to keep them independent at home. 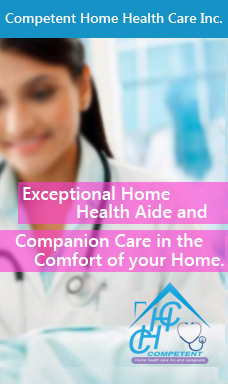 Competent Home Health Care can keep you or your loved one safe and comfortable at home. Our exceptional competent home health staff will come to your home to help with anything from bathing and dressing, to meal preparation and light housekeeping. But mostly, we bring a ray of sunshine into our client’s day, and a sense of comfort to their families. By offering senior care, elder care and many of the services in home health care in Illinois. Our competent home health care professionals are insured and bonded.